Tuesday, June 6 dawned cool and sunny and beautiful. 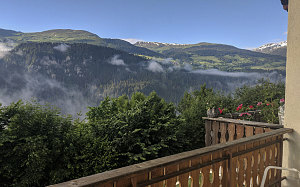 All around us, the lush green Swiss mountainsides were wreathed in morning mists. Today was our first full day of road-hunting, and I had mapped out a great (or at least what I thought was a great) series of mountain passes, all linked together in a nice big loop that would, at the end of the day, bring us back to the flat. 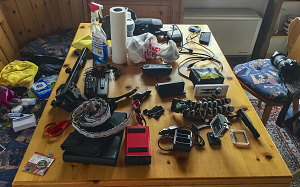 After breakfast, we set out to prep the car with all of the various audio / video / comms gear we had brought with us. 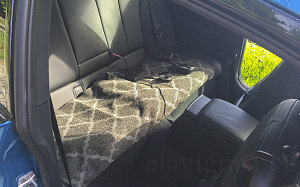 Each bit of gear had its own charging apparatus, and we had carefully engineered a wide rear-seat velcro mat where we could lay out each component, clearly separated out and with logical runs of wiring to the various charging points we had put in place (we had in advance ensured that we had sufficient USB and A/C charging capacity). 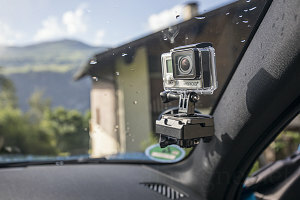 Then, with everything carefully laid out and fastened in the back seat or in the trunk, wired up, and with all of our various camera mounting solutions in place (or ready to go), we set out, trundling slowly down through the little hamlet of Waltensburg, down to the main road at the bottom of the valley. Silly Luke forgot his passport. He's not used to taking it with him everywhere he goes. Whoops. Sorry Andrew. Slow traffic through construction again. Getting to know this bit we are. Heading toward Splügenpass. Not only do they mow the medians here, but they rake it up and take away as well! Down the Italian side of the Splugenpass, stopping for pizza for lunch at a little roadside cafe. Delish! You should see the thickness of the owners manual for Andrew's car. It's English only, and there are some funny translations in it for sure. We've been referring to it whenever we need to figure out a stupid automatic setting that we need to turn off!!! 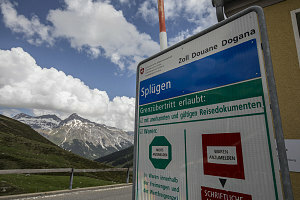 The first "destination" for the day was an out-of-the-way pass between Switzerland and Italy called the Splügenpass. 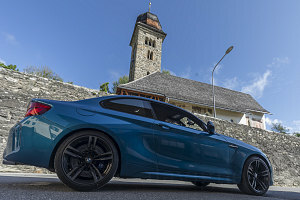 We drove south from the Swiss city of Chur towards the San Bernardino Pass - one of the more major passes into Italy - but before reaching the pass, we turned off onto a narrow side highway at the town of Splügen, soon switchbacking steeply through forest into a high alpine valley of the Lepontine Alps. 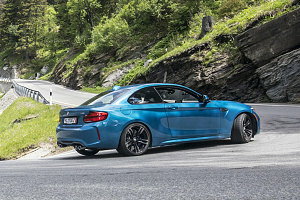 Already the road was excellent and it was fun to power the M2 up through them. The twisties stopped for a bit and the road headed in more or less a straight line up the valley floor. 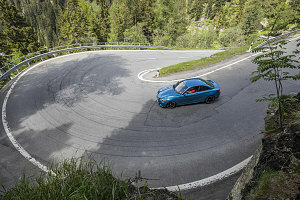 At the head of this valley, however, the road started climbing up the valleyside in an amazingly repetitive and tight series of switchbacks - often requiring nearly full lock and first gear. The road also narrowed quite a bit, not allowing for much maneuvering room, and any oncoming traffic required a bit of extra caution and care. 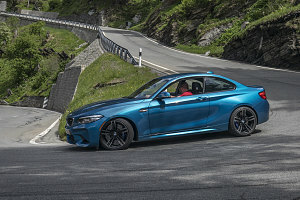 Still, we had the M2 chirping its tires into second gear on more than a few hairpin exits. Fun. At the top of the Splügenpass, we stopped to survey the scenery -- and the amazing tarmac we'd just ascended. 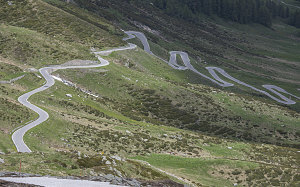 It was a sight to behold from above, this intensely-folded little stretch of roadway below us. Next, down the other side to the south. We had crossed into Italy now, into the upper Valle San Giacomo. 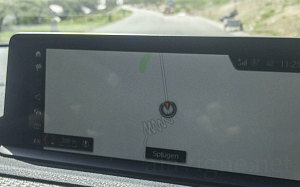 The twisties on this side were also excellent - not quite as tight, but better paved and with more maneuvering room. 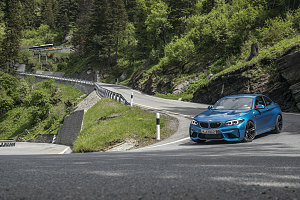 The road was actually better suited to sporty driving than had been the Swiss side. 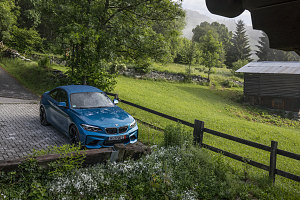 We descended through several historic old Italian towns and enjoyed several bursts of excellent twisties, before hitting the lower, flatter part of the Valle San Giacomo. 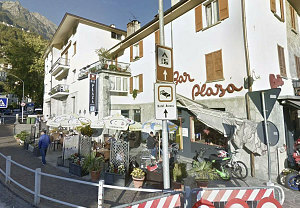 From here more sedate highway brought us to the now-thoroughly Italian town of Chiavenna, where Luke and I stopped for a pasta lunch at a place unimaginatively named "Bar Plaza", right at the main roundabout in the town. After lunch, it was time to head up to the second destination of the day - eastward and upward to a pass called the Malojapass. The road to the pass would lead us back into Switzerland (the pass itself is entirely within Switzerland). 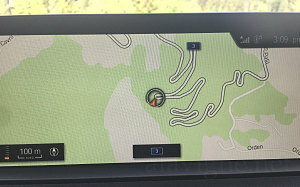 The Malojapass really only has twisties on one side, on the approach from the west. Once you reach the pass, the land opens out onto a high valley and doesn't really descend all that much on the eastern side. The pass is also not that high, and the ascent is mostly in the trees, and not in open alpine. 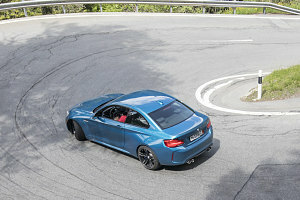 Overall, it doesn't sound all that dramatic - but oh... oh, don't be misled - for the Malojapass's twisties are *to* *die* *for*. You may ask "why does Andrew have such a positive impression of the Malojapass?". The answer is twofold... well, maybe threefold: complex, tight, continuous curves; excellently engineered and paved; and thirdly... LOTS of room. I mean huge amounts of space in the turns - three, maybe even four car-widths in places. 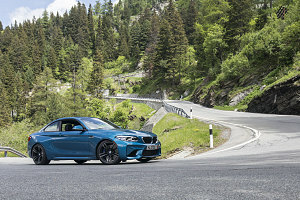 This means you have lots of maneuvering room; there are no worries about intersecting oncoming traffic, and there's lots of comfort in knowing that even if you were to go a bit sideways with spirited driving, you had a lot of runout. Needless to say, Luke and I had a lot of run with this pass. In several spots I got out and had Luke do several up and down runs, trying to capture the excellence of the twisties from several angles. The view from near the top of the pass looking back down evokes a pavlovian-type response for anyone into canyon-carving - such is the perfection of this sinuous, winding route (the response in this case isn't salivation, but rather the motions of turn-in and heeling-and-toeing - that sort of thing). Oh, Malojapass - you truly are a work of art. The only negative thing I have to report is that during the middle of the day, it's busy. Traffic, I mean. Quite a bit more than we'd have liked, and although the spaciousness of the turns helped, tons of traffic - some of it big trucks, does spoil the fun. I'd love to come back here after or before hours - then it'd be truly sublime. 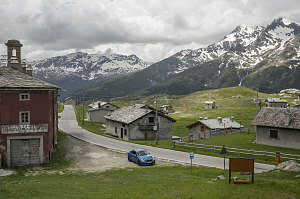 As I mentioned earlier, the Malojapass leads up and into a high valley - the valley of the Engadine. 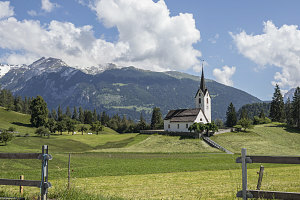 One of the more notable settlements in this valley is St Moritz, well-known for its winter sports scene and also as a former Winter Olympics host. 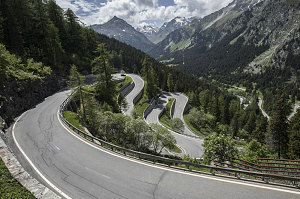 We didn't make it as far down the valley as St. Moritz, though, for we turned off, heading back north, to the third "destination" in today's grand loop: the Julierpass. The highest and most alpine-feeling of the three passes we drove through today, the Julierpass didn't offer the level of sporty, twisty driving that the first two did, but it was still quite good in spots, well-paved, and offered the most impressive mountain scenery of the three. And it was a nice way to get us back to the vicinity of Chur - and from there, the short drive back up the Vorderrhien to Waltensburg and our flat. Tons of snow in the higher passes here. Using Instagram as that seems to be the easiest way to share things. We are now officially into chill-out time as the car stuff is now sorted out and we can just focus on enjoying it and the scenery around. Back at the flat after a stellar day of twisty road driving. Three very different passes. Pasta for dinner and a yummy yoghurt. Andrew's trying a little drone flying and I think I shall hit the sack early. 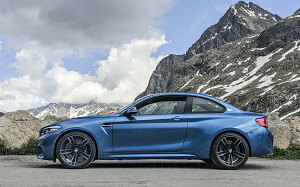 All in all, it had been an excellent first full day of post-break-in driving: Sunny weather, plenty of excellent mountain roads of varying character, beautiful alpine scenery, a tasty lunch in an Italian town. 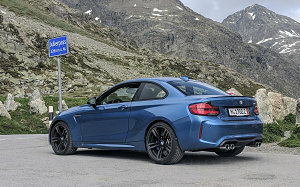 We were also becoming quite familiar with the M2 - both with its driving character (composed and very controllable - even with DSC fully off), and with its level of comfort over a day's worth of driving (quite acceptable, actually, for this sort of vehicle).